This DVD is a crochetme workshop DVD and focuses on making crochet motifs, including different types of motifs, joining, colorwork, and designing with them. Each section can be played by itself or you can play all sections at once. 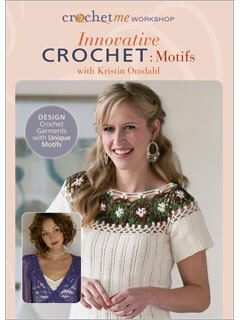 There is also a link to a free copy of Kristin’s Farrah Wrap from her book Wrapped in Crochet. In addition to showing how to make the different types of motifs (round, medallion, square, and hexagon-shaped), Kristin shows how to read and use symbol charts. She also shows the stages of and the finished motif from the example chart so you can see how it comes out. Kristin starts with the beginning slip knot and continues with chaining, joining to form a ring, then continuing with each round and how to make each crochet stitch. Each round is explained then Kristin shows how to make that round. The camera is placed above Kristin’s hands so you can easily see how each stitch is made and how she holds her yarn. To be honest, I’ve never seen anyone hold the yarn the way she does in her left hand but I can see how it would help to keep your tension more even which will increase the accuracy of your pieces. I did try to hold my yarn following her instructions but I’m not sure if my hands are too small or if I’m just too stubborn to get past any blocks I have. I really like how detailed Kristin is in explaining how each stitch is made, techniques for working in stitches, different methods of joining motifs, and using motifs for edging. This DVD is an excellent overview, not just for motifs, but for learning different crochet stitches along with practical advice. P.S. Count how many times Kristin says “Oops” – I’m glad they left those in as it gave me the giggles every time it happened.